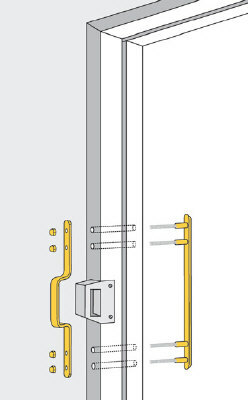 This is a unique bolt through version of the shorter London Bar - with two plates. The external plate is flat with a bevelled edge designed to resist side impact. The internal plate has a 'D' shaped staple to fit over the rim lock staple. Supplied with 4" long bolt fixings. Very carefully check that the StapleGuard staple size that you order, is the correct size that you need to fit over the door's nightlatch or rim lock staple. It will fit over the lock staple and has a small cut out section to allow the Springbolt of the lock to pass through.